Reduce, reuse, recycle. This Earth Day, Public Architecture will advance the conversation around this old adage through the launch of a new web resource devoted to material reuse in design and construction. With straightforward advice from reuse experts and clients alike, the Design for Reuse Knowledge Exchange will act as living encyclopedia of projects and resources about salvaged and reclaimed materials and a platform for demonstrating why and how to reuse. ScrapHouse was a six-week blitz build for World Environment Day 2005, assembled completely out of scrap materials. We realized while developing the Primer, that there is a hunger in the industry for alternatives to traditional methods of material consumption and demolition. In honor of Earth Day, the national nonprofit Public Architecture is launching the Design for Reuse Knowledge Exchange dedicated to the knowledge and practice of material reuse in design and construction. The resource works to expand the arsenal of green building tools available to designers, builders, and clients. It also broadens how we as a society can make use of previously discarded materials at a variety of scales. This online exchange was developed to complement the highly successful “Design for Reuse Primer,” a free e-publication released last September, featuring 15 innovative projects from across North America. Along with an expanded project gallery and insights from the field, the “Design for Reuse Primer” will continue to be available for download on the site. The Primer was sponsored by a generous Research Fund grant from the US Green Building Council and further support from the Boston Society of Architects made the new web resource possible. Featuring a robust project gallery that can be sorted by location, project type or material, the Design for Reuse Knowledge Exchange acts as a living encyclopedia of projects throughout the world that incorporate reclaimed materials. With 30% of the world’s raw materials going towards construction, these projects prove reuse offers a route towards sustainable development that minimizes our impact on the planet’s resources. “We are filling a gap,” says Liz Ogbu, Associate Design Director of Public Architecture and editor of the “Design for Reuse Primer.” “We realized while developing the Primer, that there is a hunger in the industry for alternatives to traditional methods of material consumption and demolition.” Intended to be an evolving resource, visitors to the site can submit suggestions of additional projects and resources to be added to the respective catalogs. Public Architecture is a national 501(c)(3) nonprofit organization established in 2002 that mobilizes the design profession to enact social and environmental change. 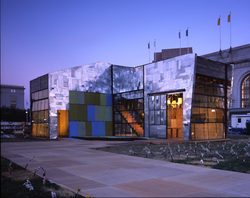 In 2005, the organization erected a two-story house, dubbed ScrapHouse, made entirely out of reclaimed materials on Civic Center Plaza in San Francisco. Since then, the organization has been a leading advocate for material reuse. Public Architecture also runs The 1% program, which challenges architects nationwide to commit a minimum of 1% of their billable hours to pro bono work. Design for Reuse Primer: IntroductionFree e-publication released last September, featuring 15 innovative projects from across North America.